I don’t like complaining but when I receive such terrible customer service I feel it my duty to warn others so they don’t make the same mistake. For my sister’s 19th birhday party she wanted a special cake so she ordered a topsy turvy one from Cakes by Shelly in Eaton Bray (near Luton, Dunstable and Leighton Buzzard). We picked up the birthday cake on Saturday, kept it at room temperature in our store room and then took it to the venue on Sunday. When we cut the cake at around 5pm on Sunday it was terrible, so dry that it was inedible. The chocolate sponge wasn’t even brown, it had flecks of white like it had been sat out for days. The vanilla sponge was just as dry. Noone ate it, all the pieces we cut were left in their plates, what a terrible waste of £60. We called the cake company and left a phone message on Monday at 4.30pm but noone called us back until Tuesday. When they did call back it was a chap called Daniel, the lady that made the cake, Michelle did not talk to us as she was “busy”. 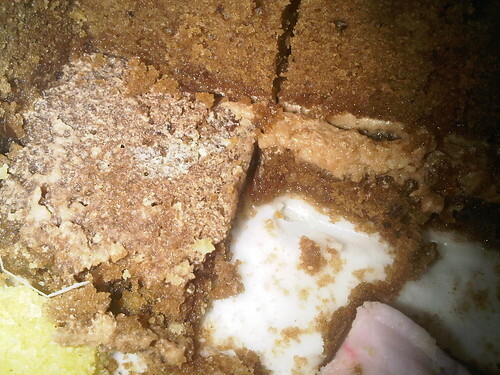 Here are some photos which unfortunately don’t show how awful this cake was. It was dry as a bone and hence why the cake wasn’t finished. We didn’t call within 24 hours – we called within 24 hours of cutting the cake. We didn’t know there was a problem before that, we’re not psychic! 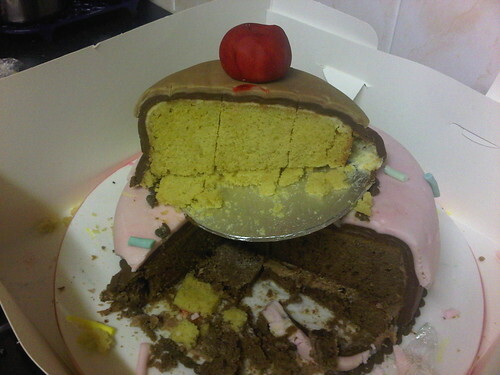 Their website said the cake should be good for three days, we cut it within one day and complained within two. They claimed they made the cake on Saturday – in my opinion the cake was so dry it tasted and felt like it had been left out for days or been baked too much. There was a problem with their phone so they couldn’t pick up our call before that – that’s not our issue. They didn’t get to see the cake soon enough to assess the quality – we offered to take it around but they said it was too late now. If they had picked up the phone on Monday we could have taken it straight around. They offered us a 50% discount on the next order as a “goodwill gesture” but that’s not good enough. Why would we order such a sub-standard product again and even then only get half off? When I said I would blog about this ordeal and that word of mouth is powerful they retorted with “reputation is powerful too”. Why do they think these two things are mutually exclusive? Your reputation isn’t just based on the number of awards you’ve won. Not only are we disappointed with the product but their customer service is shocking, they just make excuses for their mistakes and were adamant in blaming us. They didn’t even give us a chance to show them the cake. Wouldn’t it have been better to admit your mistakes than lose a customer and many potential ones who read this blog post? I’m an amateur baker and I could have made a cake miles better than this one! What a waste of £60 and a disappointment to my sister on her birthday. We certainly won’t be ordering from them again and recommend you don’t either. put me in the amateur baker category and i too could have come up with something better. that looks truly awful. hope it didn’t spoil your sister’s birthday party. No it didn’t but it was no thanks to them! The frustrating thing was arguing with that chap on the phone whilst at work today. He just wouldn’t accept any liability. Poor show. That is terrible! I can’t believe they said that to you. You can clearly tell by looking at the pictures how dry the cake was! the shame of it is that the cakes on their facebook page look impressive and have lots of praise. but based on your experience it seems it doesn’t matter to them if they make one bad cake out of whatever. agreed on poor show, have they not asked to see the cake or anything?! Nope, we did offer to take it to them but they said it was too late! interesting. they have removed your link to this review of their facebook page. what a way to build a reputation! I got a call from them today saying they have sought legal advice and that my comments are a defamation of character! What do they think a bad review is?! They wanted me to delete some of the things I wrote within 7 days. Anyway I contacted my lawyer who advised to change the wording of one of the lines to state it is my opinion which I have now done. The truth will prevail – their cake was terrible and they wouldn’t admit it. there’s something about a reputation on facebook isn’t there, which for me personally doesn’t really mean much especially if it seems that comments that are not bowing down in praise are deleted.